ENGLEWOOD, Colo. (AP) — Chad Kelly outshined Paxton Lynch in the Denver Broncos‘ scrimmage Sunday, and that might have earned him work with the No. 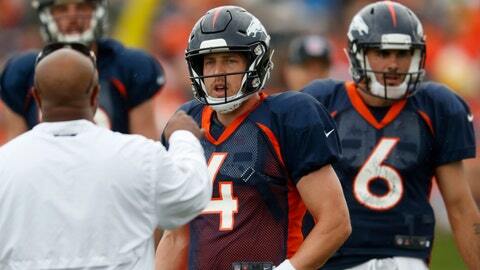 2 offense in his quest to win the backup job behind Case Keenum. Still, Kelly, a seventh-round pick out of Ole Miss in 2017 who sat out his rookie season with knee and wrist injuries, has looked significantly sharper than the error-prone Lynch, the 2016 first-round draft pick from Memphis who failed to beat out another seventh-rounder, Trevor Siemian, in 2016 and ’17. “He was good. You know we have a really good defense and when you turn on the lights and have a real pass rush, that’s a top-5 defense. So, I’m not surprised,” Joseph said. “And it’s been more competitive this year than it was last year offensively. They’ve won more days than they won last year at training camp.